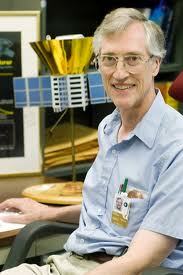 John C. Mather won the Nobel prize in physics in 2006 for his work on the COBE satellite measuring the black-body radiation for the cosmic microwave background with startling precision. Time Magazine listed Mather as one of the 100 most influential people in the world in 2007. As a senior astrophysicist at NASA’s Goddard Space Flight Center, Mather now serves as the senior project scientist for the James Webb Space Telescope (JWST), a successor to the Hubble Space Telescope. Nobel laureate John Mather with a model of COBE. On a rainy afternoon, John took some time away from his work on Jams Webb to talk to me about winning a Nobel prize, and how he learned about marketing. MJK: John, I think of you as a kind of humble person, despite all your accomplishments. What can you tell me about the importance of being humble? But I think that as a life strategy, being modest is very important. Science is a very, very social enterprise in a way that the general public does not expect. The teams you’re working on have ten or even a thousand people. So you have to learn to assume that there’s somebody on the team that knows something you don’t know. You’ve got to be able to find those people who can solve a problem you can’t solve. Another way of saying that is that in a big project the bottleneck is at the top. If work is not going well it’s probably the boss fault. If the boss is someone who says that I have to direct everything and I have to do everything myself, then it’s hopeless. MJK: What do you think about the idea of Marketing for Scientists? JM: I think it’s something that we have to learn how to do, though we have to learn it on the fly and we often don’t really know what we are doing. The whole idea that we need to talk to people the way that they are as opposed to the way we are is foreign to many scientists. Some scientists feel the public is stupid or foolish or uneducated and they don’t understand us. I tell them: that isn’t going to win you any friends! We should all be learning how to talk to the public, and they are not stupid or foolish or uneducated any more than we are. If we want our projects to go forward and they cost more than we have in our billfold, well then someone else has to pay for it. So marketing is really a central part of scientific life. When I talk to students I say reading and writing and speaking are all important. If you have a chance to take courses in these subjects—do it now. And if you’re going to persuade someone of something, you’ve got about three seconds to grab them. People make judgments very quickly. MJK: Did you think about marketing at all when you were doing your Nobel-prize winning work? But then we did give a lot of thought to how we would tell people about our work. Our project team members practiced a lot giving our talks. We were using transparencies back then. We rehearsed and we corrected each other’s mistakes. Then later there was something we felt we had to do that was about marketing. We had to write a book, and there was a special reason we had to write it. The other [soon to be] Nobel laureate on our team had written his own book [Wrinkles in Time by George Smoot]. And the rest of the science team really thought it exaggerated George Smoot’s role and responsibilities for the project. So the science team felt that we had to have another book that told the real story [The Very First Light, by John Mather and John Boslough]. In other words, there was marketing necessary to show that the whole thing wasn’t just George Smoot’s idea. At the time, we didn’t know who the Nobel committee would be, but we were pretty sure that if they looked they would find this book. We knew that if we didn’t tell the story right, the wrong story would be remembered. We didn’t know if we had a chance for the Nobel but a lot of people thought we might. MJK: What are your tips on how to give a good talk? JM: Number one: don’t be too serious about yourself, which is another way of saying don’t be afraid. Number two: really do rehearse! It took me a long time to realize I couldn’t just do it spontaneously and get it right. And here’s something my thesis advisor told me: you have to limit what you’re trying to convey to three items. If you try to stuff more into it they won’t remember it. The audience will enjoy an elementary story well told much better than a complicated story they don’t understand. Tell them the story of Goldilocks and the Three Bears, do it well, and they will like it. MJK: Is there any other marketing advice you have to give my readers? JM: Well, I think life is a continuing education. Sometimes we give degrees for it. But most of the time we don’t. One thing I learned very early on is that you cannot always delegate things like this. Early on in the COBE program, we needed a brochure. I decided then that I didn’t want to take time to do it myself, so I worked with some science writers. But I kept telling them the story and it kept coming back boring. We were shopping for cars at the time and my wife Jane said: look at the brochures the car companies make about their cars. They used space and color—they weren’t just using words to tell their story. That told me I had to orient my story around pictures. So I tried writing the brochure myself, with that in mind, and it came out much better. I tried to make it so there was continuous action, and the reader would have to go with me from place to place. I think it worked. Of course, now I do a lot of writing. It did not occur to me at first that I should do what they said to do in high school: make an outline. Things are easier now that I can make an outline. And I do depend on other people (like my wife) to see if I have succeeded with what I’m trying to say. John emailed me the week after the interview with more to add. JM: I didn’t say this in the interview, but I’d like to add: We wouldn’t exist if it weren’t for marketing. Ever since the first animals got to choose their mates, there has been marketing. Ever since the first animals got to eat plants or other animals, there has been marketing. Marketing is communication for hoped-for benefit (that’s not what the businessmen mean by the word). When Columbus asked Ferdinand and Isabella for money, he was marketing. When the antelope jumps straight into the air in front of the lion, he is saying, you can’t catch me, don’t even try. [See the theory of costly signaling: http://en.wikipedia.org/wiki/Signalling_theory.] That’s marketing too.